The VideoGuard Panel is the hub of the system and supervises all peripherals. It communicates with the central station over the mobile network and is designed to operate in extreme temperatures from -30° to +60°C, and robust enough to meet the most demanding conditions. The VideoGuard Indoor Motion Viewer combines a passive infrared motion sensor, a digital video camera, and infrared illuminators into a single wireless battery powered security device. It’s small sized-cameras enable it to blend into its surroundings inconspicuously for commercial or residential applications and can be installed anywhere. The VideoGuard Outdoor Motion Viewer combines passive infrared motion sensors, a digital video camera, and infrared illuminators into a single wireless battery powered security device. This rugged device is ideal to secure outdoor assets and remote facilities. 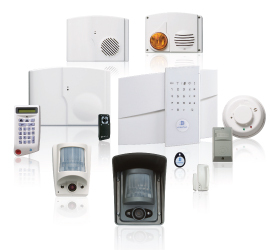 The VideoGuard KeyPad is a completely wireless and self powered for easy installation. It has an easy to read backlit display and comes with a wall/cover tamper switch. The VideoGuard Remote KeyFob can arm and disarm the VideoGuard system at distances up to 100 meters. It has an encrypted “rolling code” system that changes the actual signal sent to the panel every time it is used. It features audio feedback (beeping) at arming/disarming to verify communication with the panel and indicate entry/exit delay. The Remote can also includes a panic button feature. The VideoGuard Universal Door & Window Contact is totally wireless and can be mounted anywhere to secure door and window openings. It comes with both NO and NC terminals and can be used in conjunction with other third party sensors.